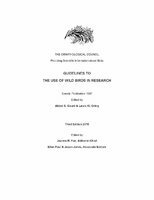 The Ornithological Council publishes the peer-reviewed Guidelines to the Use of Wild Birds in Research. It was most recently updated in 2010 and it has been our intent to supplement it with literature published after that date, ultimately developing a database that incorporates all literature cited and all supplemental literature (volunteers welcome!). The Guidelines are recognized by federal agencies and private organizations as a resource reference. It is extremely important that we provide them - and your Institutional Animal Care and Use Committees (Animal Care and Use Committees in Canada) - the most up-to-date information available. If you have published methods papers since 2010 that assess the impact of study techniques on the birds you are studying, please bring them to our attention. The OC simply doesn't have the resources to search for these studies on an ongoing basis (volunteers welcome!). Additionally, if yours is not a methods paper per se but assessed the impact of the study methods, please bring that to our attention, too.